Inside Yale University Art Gallery there is an exhibit of James Whistler's etchings from the 1800s; outside, there is an installation of a large golden box with writing engraved on it some 200 years later, inviting people to interconnect between Teheran and New Haven, Connecticut. The bolted door reads, "Strangers in Tehran are encouraged to consider the prompt, what would make it a good day for you?" 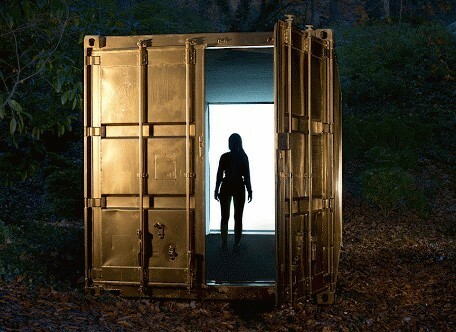 A cargo container that once delivered goods over the seas has been transformed into a portal delivering live, real-time images of people stopping by an art center with a similar set-up as the one at Yale, some 6,000 miles away. Tehrani's make appointments for an evening chat with a stranger in New Haven on a frosty afternoon, where the chilling weather can only be imagined from a distance. On the American side, the invitation is more perfunctory, the golden door says, "If you are waiting for your Portal appointment, join us across the street at The Atticus Bookstore and Cafe." I felt a little jealous, as Tehran's message was so much more mysterious, versus the straightforward American invitation that could have easily said, "The doctor is accepting patients today." Presented by Shared Studios, this canny invention of communication by Yale law student Amar Bakshi disrupts the excesses of Facebook Theater and clever Twitter banter. "The shipping container is a readymade design. It is a relatively inexpensive, uniform space that exists all over the world. They bear the markings of their prior travel. They reference the global network of trade in physical goods. We've seen them used to create everything from swimming pools to hotel rooms. 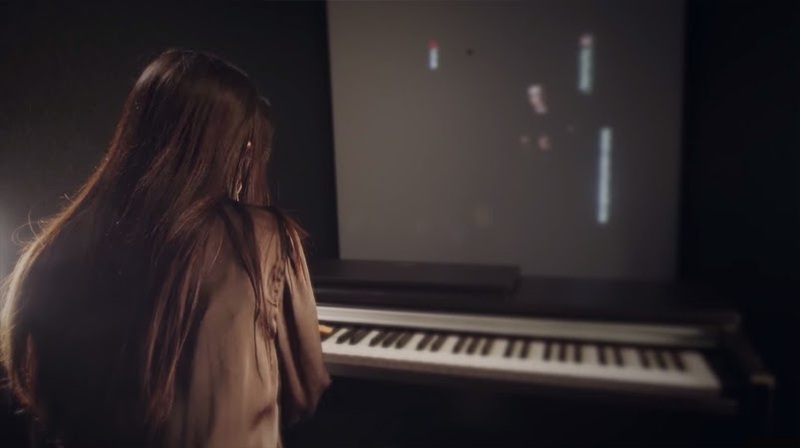 Portals facilitate de-instrumentalized encounters between two strangers. The interior space of all Portals is identical in design. The space is inclusive, private and climate-neutral. The visitor encounters a gold shipping container. Gold references both the commercial and the sacred. Visitors walk in and around a wall to enter the interior. There, they see four lights and the projected image of their counterpart in another location. That projected image is life-size. The two individuals can make direct eye contact through Portals," explained Mr. Bakshi. It's an unrehearsed encounter (though you can pre-plan what you would like to talk about), a form of expression that costs nothing to try, with everything to gain. The box contradicts our misconceptions about our neighbors in this small/enormous world in which we all seemingly have so little in common. I had asked to participate and visit Tehran for 15 minutes. A meeting was set up with a stranger at the Sazmanab Center for Contemporary Art. I was a bit lost for words, maybe because I had wanted to talk about the climate of political acrimony between Iran and many countries regarding nuclear propagation, but decided against it. It might muddy the expanse of water between us. I didn't want to take that risk, and possibly miss the opportunity to engage with a stranger in a non-political, pure way. It should be for our sakes, I decided, soul-to-soul, without preconceived notions and predictable results. I walked into a floor-to-ceiling, wall-to-wall, industrial-carpeted, soundproof environment with nothing much apparent. Suddenly, I was startled to see an image come to life. A man somewhere in his early 40s stood there in a white ski jacket with a thick head of black hair smiling at me warmly. "Hello," he said. "Uh, oh hi!" I responded. "How are you?" He asked. I think I said, "My feet hurt." It was so silly that it was embarrassing. We were both kind of fumbling and talking at the same time to each other. It felt odd. It felt risky. It felt exciting. I asked his name. "My name is Arash," he said, explaining that it means "truthfulness." We talked about movies and television. I was a little surprised. He had just watched Birdman the night before and thought it was great. His favorite television show is How I Met Your Mother, which I've never seen. He asked me where I was from and when I said, "Brooklyn, New York," he laughingly replied, "Oh, the center of the universe," with the thumbs-up sign. "Why do New Yorkers dislike people from New Jersey?" He asked. Not wanting to explain who Governor Chris Christie is, I said, "They're lousy drivers." And so our conversation went on like that. He was coming from work and could have been a guy I just happened to meet waiting on line to have dim sum in Chinatown. The point is, we are more familiar than we care to admit. We spoke on virtual typography that has no soil to covet. There was no fear of harm because our hologram selves are essence and form, the only substance available being our respective characters. If that were all that existed there would be no rancor between countries, perhaps, but that is too much to consider. Though far-fetched it made me think of the altered state of afterlife communication, and then what a great social experiment we're currently living, as the world gets smaller and our communication options grow. I also thought one day this too will seem ancient, like Whistler's etchings. Portals grew out of Mr. Bakshi's travels meeting strangers in faraway places. He hopes to keep them un-commercialized, without fees and corporate or government interference. "It should be a free thing. Anyone can join the network, regardless of their ability to pay. This is not expensive to do. It's very replicable." He plans on having future Portals in Afghanistan, possibly Gaza and Israel, Cuba, etc. He is currently putting on a Kickstarter campaign for Portals to (as Captain Kirk said) "boldly go where no one has been before." "Pairings can and will change. Different forms of distance may be invoked as the placement of the Portals and the individuals who enter into a given time change. "I asked Mr. Bakshi, is this an art or technology project? "Two strangers meet," he said. "The institution of art does not assert a singular purpose upon the encounter. Portals cannot be a technology project. It cannot scale. It requires context, ownership and activation. Portals cannot be a government project. If it were public diplomacy, it would be dismissed. Portals cannot be a corporation's project. If it were, it would be distrusted."